This developer client had acquired a site of 1 acre on which he had obtained planning consent for a group of six detached houses, but in the current market felt that an alternative consent would facilitate his plans to sell the site with consent. 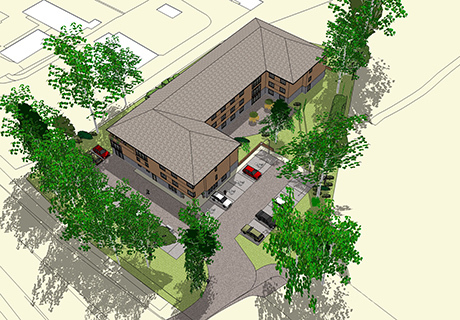 We successfully applied for outline permission for a 61 bed residential care home on the site to enable a successful sale to a care home provider. The site included a number of protected trees and the design responded to maximize the development potential whilst retaining an attractive setting.